Nomination watches are very trendy accessories for contemporary and sophisticated tastes: choose your favourite from among the wide variety of styles. There are watches whose stainless steel wrist straps can be personalised with Links from the Composable Collection, and there are also versions with watchstraps in silicon or coloured fabric. The most exclusive women’s watch looks like a bracelet: a long leather watchstrap wraps elegantly around her wrist and can be personalised with charms from the MyBonBons Collection. Also just for her, we have watches with pastel-coloured silicon wrist straps: perfect for the active, dynamic young woman on the go, the Time watch with soft-touch finishing is available in several colour variants. Discover all the watches from the Time Collection: the most classic of elegant accessories for him and her, they’re available in many versions to match with all your outfits, from your most casual to your most formal looks. The watch par excellence has its wrist strap in stainless steel: Nomination’s Time Collection offers a lot, but one watch in particular is a step above the rest. We’re not talking about a basic watchstrap, because in this case, Nomination’s version can be personalised by simply adding Composable Links. 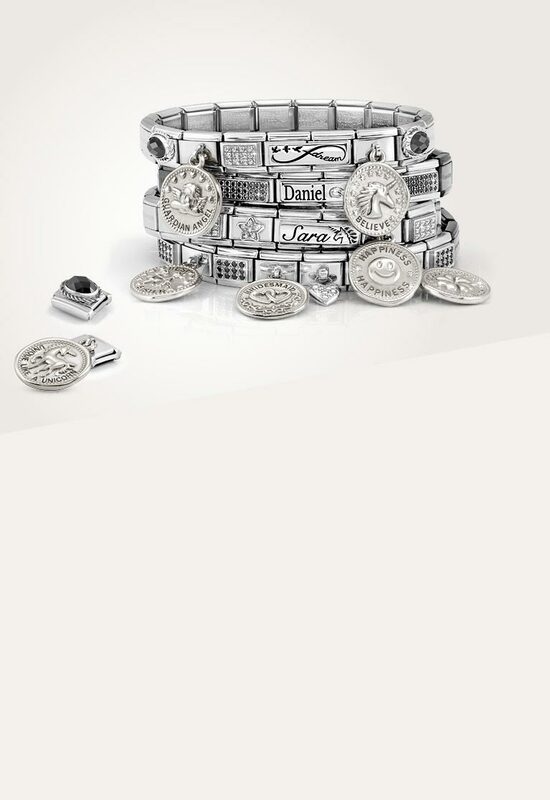 Choose Links with your favourite symbols, letters, or charms and create a watch which speaks about you and tells your story. Choose from tons of Links dedicated to every occasion: from those representing important family events to others that are perfect for birthdays, and even romantic Links for yourself or as a truly unique gift. Nomination’s Time Collection has lots of his and her models to choose from, with round or rectangular dials with monochromatic faces, or with prints or chic mother-of-pearl. There’s a large offering of men’s watches from Nomination’s Time Collection, from classic versions with personalisable stainless steel watchstraps, to more casual versions with fabric or silicon wrist straps. A good sporty watch for men has a large round dial and a watchstrap in bicolour fabric, available in several colour variants, or alternatively with a silicon watchstrap. Perfect for the man who’s always on the go but never wants to be without this elegant accessory, the Pure watch has a round dial and silicon watchstrap with comfortable soft-touch finishing and is available in white, black and blue. Nomination watches are fashion-forward accessories available in many different versions for every budget. Starting with the most casual, this watch has a coloured silicon watchstrap: it’s the perfect gift idea for a boy for his birthday or for a special event like a graduation. Then there are watches with stainless steel wrist straps: a bit more classic, this accessory is personalisable with Links from the Composable Collection dedicated to life’s most important moments. Discover the full selection of Nomination watches and choose the one best suited for him or her, if you’re looking for an original, high quality gift.